Needs: A wide-mouthed 2 quart jar, 3-4 small canning lids without rings, and a jar that will fit inside the 2-quart jar OR a fermentation crock set-up. Crush the garlic and set aside. Tear the bay leaves into about 1/4 inch pieces and set aside. Measure out the sea salt and put it in a small bowl. Each time you empty sliced cabbage into the bowl, distribute some garlic, some salt, and some bay leaf pieces, and stir well to combine. Try to guestimate how much to use so that you distribute these evenly over the whole batch. I like to use a big wooden fork (for tossing salad) to stir. Add the water at the end and stir it in. 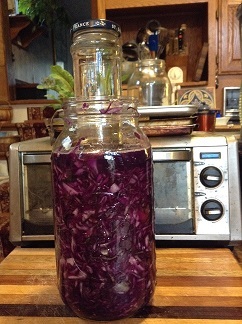 When all is distributed, pack the cabbage into a 2-quart jar, pushing it down with your clean fist, to squeeze out liquid that the salt starts to draw out of the cabbage. 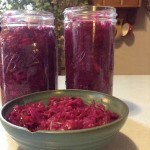 Once the jar is packed, make sure the top of the cabbage is at least 1 inch below the top of the jar. If not, use a bigger jar, bowl, or crock. Now put the jar lids INSIDE the jar on top of the cabbage (or if you're using a wider container, a small plate), so that they cover most of the surface of the cabbage. Choose a jar that will fit inside the container you are using and stick up out the top of it. Fill it with water for weight, and place it inside on top of the lids (or plate). Push it down so that liquid starts coming over the lids, and all of the cabbage is submerged. Any cabbage exposed to oxygen will eventually rot. It needs to stay under the liquid to ferment. Then cover the container with a dish-towel and set it in a corner of your kitchen to let the wild bacteria do their job! When done, cover tightly with a lid, and place in the fridge, where it will slowly continue to ferment and not spoil! 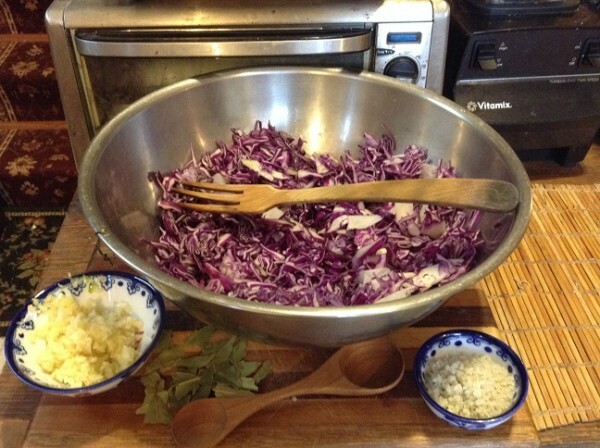 Enjoy your red cabbage as a side with any meal, right on top of a salad, or even stirred into a dish! I learned the fine art of fermentation first from Sally Fallon's Nourishing Traditions and then from Sandor Katz's Wild Fermentation. Both are highly recommended!